Easy access to community support. The Course is backed by science. Absolutely NO guessing involved. The Truth Course will walk you through EIGHT-Steps to consistent explosive rotational power. There are OVER Eight hours of mobile device compatible videos. Watch the whole Course anywhere with an internet connection! CLICK HERE to invest in The Truth About Explosive Rotational Power after watching the baseball hitting video rotational truth minute tour now. Tensegrity, OR Tension Integrity (discover how explosive the body’s own natural springiness can be). 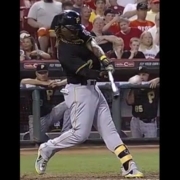 The first baseball hitting video spine mistake was leaked from The Truth About Explosive Rotational Power online video course. This is all a part of the human movement rules. As you can see, breaking our spinal integrity at contact can have a bleeding force effect on performance. What baseball hitting drill to work on next. It’s so fun to see young men – like Braden – begin to build in human movement principals like Un-Weighting and notice an instant jolt in force at contact. I ask all my students, if you wanted to live, would you rather get hit by a train going thirty miles-per-hour, or a motorcycle going sixty? I’m working with Braden on throwing his body mass at the ball. Much like a projectile missile. This helps to make the bat feel lighter to the hitter. And be able to turn harder with less muscle involvement. The swing is a transfer of energy. We’re taking the potential energy contained in the hitter’s body, and getting it moving to transfer into the barrel. 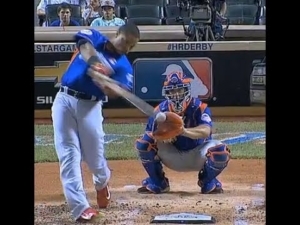 Then effectively shift this moving energy into the incoming baseball. 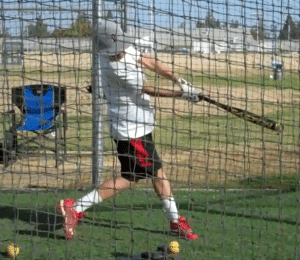 CLICK HERE for a YouTube baseball hitting drill video I put together that demonstrates the power of the Un-Weighting Principal. 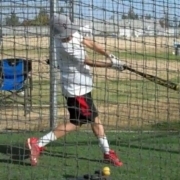 What Baseball Hitting Drill to Work on Next? 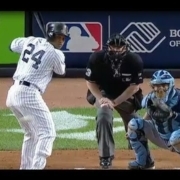 Not every great MLB hitter walks away from their hands. And not every great MLB hitter is swinging as effectively as they can. We tend to study the wrong hitters. And the camera view matters. How his swing resembles a snapping of a towel. Matt Holiday struggled to get his hands into position early on in the Series, but later – almost too late – he figured out his timing. 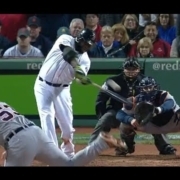 Whereas Big Papi was red hot through the whole playoff and World Series. He was able to get his hands into the correct position to begin his Final Turn. 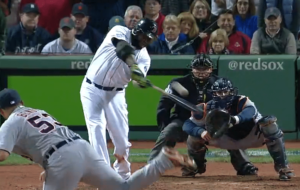 The MVP trophy was well deserved for Mr. David Ortiz in the 2013 World Series. CLICK HERE for the full video on the historic playoff grand-slam.